Two species of agave are used to produce Derrumbes Michoacan: agave Cupreata brings mature fruit aromas, while agave Cenizo brings more herbal notes. Cooked in an underground stone pit using black oak, Derrumbes Michoacan is fermented in underground tanks lined with pine wood which adds to the herbal character. 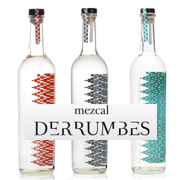 True to the tradition of mezcal production in this area, Derrumbes Michoacan is distilled using the Phillipino method, which predates copper-pot distillation. This technique requires the body of the still to be made from wood, with the alcohol vapours condensed by a copper pot full of water that sits at the top of the trunk. This process adds to the unique character of Derrumbes Michoacan. The agave in this mezcal is cooked in an underground stone pit using black oak to give a light smokiness, which complements the mineral and fruit notes of the Espadin agave from which it is crafted. The fermentation is naturally aided by the addition of pulque from the agave Americana before wild yeasts complete the 72-hour process. Derrumbes Oaxaca is twice-distilled in copper pot stills. Made from the region's wild agave Salmiana, it gives the mezcal a unique, vibrant flavour. Despite its abundance, this agave has a very low yield, needing up to four times as much to create an equal amount of spirit when compared to the blue agave used in the tequila region. Grown in calcareous soils, this mezcal terrifically showcases its terroir characteristics, with chalky notes very evident in the flavour profile. Produced in an old traditional hacienda, above ground ovens known as hornos are used to cook the agave which mean their mezcal is not smoky. Once cooked, the agave is crushed by a tahona, fermented naturally with wild yeast, twice-distilled in small copper pot stills.